[map] [street view] Just south of Veterans Drive in Florence, off South Chestnut Street, behind the station's studios. Florence Broadcasting Company (Clyde W. Anderson and Joe Van Sandt) put this station on the air in 1945 on 1340 kHz with the WJOI calls, running 250 watts via a Gates 250C transmitter. Both the studio and transmitter site were originally at 850 South Court Street, just north of the Tennessee River and Florence Harbor. It was affiliated with the ABC network. They attempted to move the station down the dial to 1280 kHz in 1946, but it was denied by the FCC. In 1952, the station spawned the first FM broadcaster in the Shoals area, the short-lived first incarnation of WJOI-FM, on 98.3 MHz. Both the AM and FM moved to a new home at 624 South Chestnut Street in 1959, and the AM is still broadcasting from here to this day. The station received a boost in daytime power to 1 kW in June 1962, with a Bauer Type 707 transmitter. The station was acquired by WJOI Radio, Inc. in 1966. During this time, it was affiliated with the Mutual network. In 1967, they launched another attempt at FM with WJOI-FM, this time on 107.3 MHz, with 25 kW. This wasn't built from the ground up, but purchased from cross-town Radio Muscle Shoals, who had it operating at low power as WOWL-FM. The station's call sign changed from WJOI to WXOR in 1973; An NBC-owned FM (formerly WMAQ) with a Beautiful Music format paid dearly for the "Joy" call sign! Around this time, the legendary Sam Phillips (of Sun Records fame) became president of the company. The company name changed to WXOR entertainment in 1977, but that was quickly replaced by the more imaginative Big River Broadcasting name in November of that same year. From the mid-70's, the station was known to have a Country music format. The calls changed to WSBM in 1984. According to the NAB, in 1985 the station was broadcasting in stereo with the Harris system. Towards the end of the 80's, the competition from FM caused the station to drop the Country format for Beautiful Music. The station's format flipped to Urban Adult Contemporary in the early 90's, as "Magic 1340". 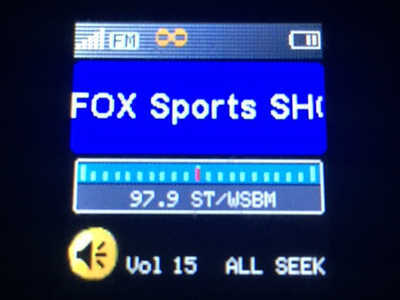 Urban gave way to Fox Sports Radio in May 2010; by January 2013, the station had changed to CBS Sports Radio affiliation. Later, they went back to Fox Sports, with the "1340 The Ref" slogan. In 2014, the station picked up a translator on 98.5 MHz, which later moved to 97.9 MHz for better coverage.